We destroy all your unwanted paper and other material onsite, at your premises, or offsite, where we take it away. The destruction of confidential data and documents is part of the cycle of any business. No matter whether you need a one-off cleanout or a regular collection service, you are just wanting to get rid of sensitive documents, hard drives or other magnetic media, our confidential shredding services offer you peace of mind from the worry of data theft, along with compliance with government regulations, and environmentally-friendly credentials. We safely dispose of paper-based documents, information, files or records that contain sensitive and highly confidential information. Our secure document disposal service is available to Brisbane & South East Queensland businesses, individuals and large scale organisations. If you have an office environment that handle sensitive documents , allow Shred Easy to take care of them for you. We can also provide secure bins for your Brisbane business and remove and shred them before recycling. Shred Easy paper, uniform, media and secure document destruction and shredding service save your business time and money. We conduct regular or one-off shredding operations at your premises or off-site making your security and peace of mind our first priority. 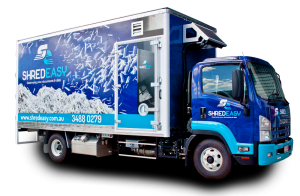 To discuss your shredding or document destruction requirements, contact Shred Easy in Brisbane today! Need a quote? Well, now you can get one with our NEW Online Quoting System! Just click on the Online Quote button and follow the prompts. And if you are wondering how the whole shredding process works, then just have a quick watch of our video, which explains just how easy it is, whether you are a business or just need your home office cleaned out. It's Shred Easy!